The Group of Bioorganic Chemistry is housed in newly refurnished laboratory space with individual fume cupboards, dedicated writting-up areas (both inside and outside the lab space) equipped with computers connected to internet and a suite of instruments rooms. 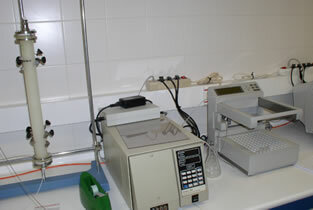 The laboratory is well-equipped with routine equipment for organic synthesis. 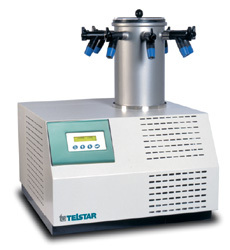 These equipment include magnetical stirrers (heating and magnetic), water-free rotatory evaporators (equipped with membrane pumps, vacuum controllers and chiller), vacuum pumps, dessicators, mechanical stirrers, motorized syrynges, coolers for low-temperature reactions (up to 173 K) and all the necessary glassware. The carrussel systems allow multirreactions for preliminary assays at temperatures ranging 273-173K. 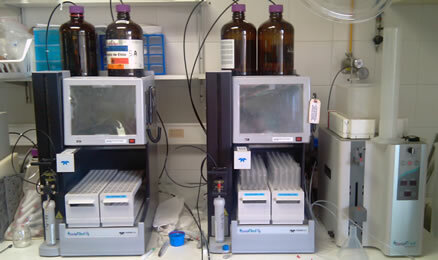 Purification of materials are made at different levels in our laboratory of analysis and purification. We use rapid and efficient radial chromatography for preparative samples to be ready in less than thirty minutes. For large amounts and/or separation of close-running isomers we have the MPLC system. Finally, a complete analysis of our products and obtention of extremely pure samples we utilize our diverse-oriented HPLC systems. With the Chromatotron we can purify in 15 minutes and spending no more than 300 mL of eluent up to 1.0 gram of sample. The system is extremely efficient and rather useful for easily separable mixtures or purification of starting materials. The solvent is pumped by an special teflon-solvent-resistant pump and the eluent can be collected in a small automatic fraction collector. The evaporation of fractions can be done in the same laboratory by using the rotatory evaporation system installed close to the chromatographic installation. 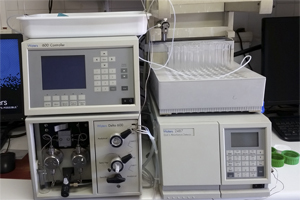 We have in our laboratory five full HPLC systems for general use of our researchers. HPLCs 1 and 4 are dedicated to normal fase HPLCs 2 and 5 are dedicated to reverse phase HPLC 3 is versatile for both uses All the systems are computer operated, based on Millenium software to allow for better data collection and storage. These HPLC systems allow us to perform a wide range of procedures, including new method development, analysis of reaction mixtures and larger scale separation of products. We have also a large number of normal and reverse phase columns in both analytical and preparative sizes. We have chiral columns (IA, IB, IC, OD-H, OD-J, etc.) for enantiomer analysis, too. Depending on the system used, detection is accomplished using Ultraviolet Absorbtion (dual band and/or PDA detector) or Light Scattering (LSD). Typical amounts for analysis are 0.1-1 mg, where as semi-preparative methods can handle from 10-200 mg depending on the quality of separation. The lyophilization process allows to obtain extremely pure compounds since no degradation is observerd from the first freeze step of the sample. After sublimation of the solvent (water) crystalline compounds are obtained. 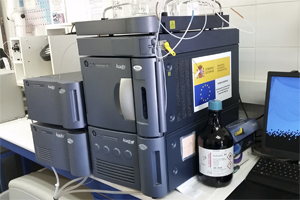 This system is particularly useful for us to eliminate solvent from semipreparative HPLC fractions. Thus, after purification of the products by HPLC it is possible to eliminate the solvent (water) without any degradation of the product to be obtained. 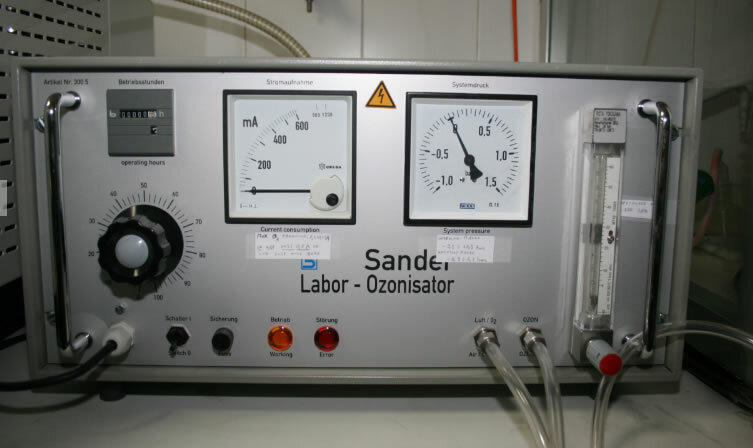 The lyophilizer is equipped with high-vacuum pumps that remove the non-condensable gases. Several high-preformance computers with a total of 64 processors are used locally for theoretical calculations. HPC calculations are carried out on clusters with thousands of processors. Recently we have acquired an equipment for carrying out GPC computing on graphic cards with a total of more than 6000 processors.